Samayavajra (Tib. Damtsig Dorje Depa) is the essence of the holy mind of all the infinite Victorious Ones. 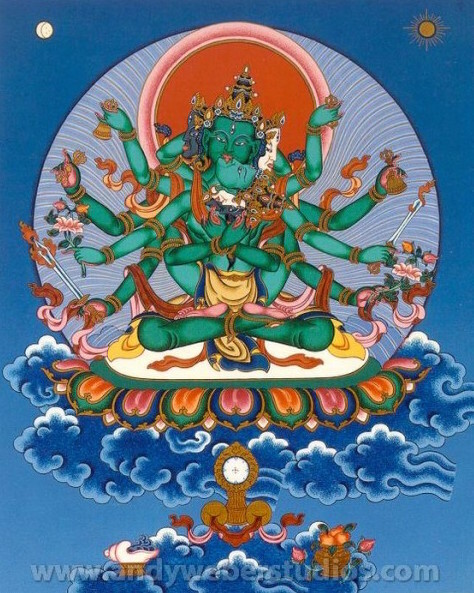 This deity belongs to the mandala of Guhyasamaja tantra, the “secret Assembly”—the gathering of 32 deities. This particular practice purifies degenerated commitments and vows, and particularly purifies all transgressions in the relationship with one’s spiritual guide. It is also one of the nine preliminary practices in the Gelug tradition. Prerequisites: One is a Buddhist, ie has taken refuge in the Buddha, Dharma and Sangha, and has a good foundation in the lam rim and the sutra path (at least having some experience of renunciation, bodhicitta, and wisdom understanding emptiness). This jenang can be take as a blessing.